1단으로 이루어진 기단(基壇)은 4장의 돌로 구성되었으며, 각 모서리와 면의 가운데에 기둥 모양을 새겨두었다. 기단의 맨윗돌에는 특별한 장식을 하지 않아 두껍고 밋밋하다는 느낌을 주는데, 이러한 양식은 정읍 은선리 삼층석탑(보물 제167호)과 비슷하다. 탑신부의 1층 몸돌은 기단에 비해 좁고 기형적으로 길고 높은 매우 특이한 양식을 보이고 있다. 지붕돌은 몸돌에 비해 상당히 넓고 두꺼워 불안정한 느낌을 주며, 각 층 지붕돌의 모습에도 차이가 있다. 지붕돌 밑면의 받침수 또한 1·2·4층은 5단이고, 3층은 4단, 5층은 3단으로 정형화된 양식에서 벗어나 있는 모습이다. 탑의 머리장식부분에는 구슬 모양의 장식만 있을 뿐 다른 부재는 없다. 이 탑의 기단부와 1층 몸돌은 매우 길게 조성되어 은선리삼층석탑 양식을 따르고 있다. 이는 부여 정림사지 오층석탑(국보 제9호)을 모방한 백제 양식이 국토의 최남단 섬에까지 퍼졌다는 점에서 의의가 크다. 각 부분의 양식이 독특하고 불규칙적인 면이 많아 탑 양식에 지방색이 많이 드러나게 되는 고려 후기에 건립된 것으로 보인다. It is said that there used to be a temple called Haewolsa from the Goryeo period. 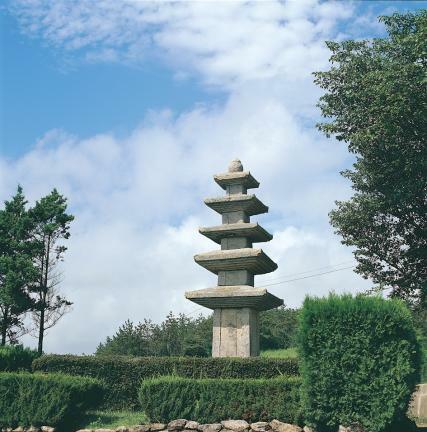 This stone pagoda belonged to this temple, and it probably had not been moved from its original location since its construction. Its single-layered stylobate is composed of four plank stones, and each of its corners and sides is engraved with the shape of a pillar. The top stone of the stylobate does not have any particular decoration, so it looks too simple and heavy. 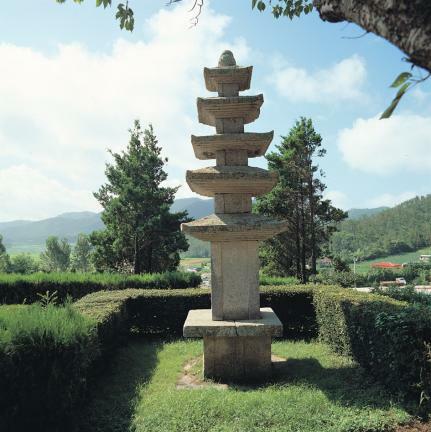 Such style is similar to that of the Three-Story Stone Pagoda in Eunseon-ri, Jeongeup (Treasure No. 167). What is very unique about the pagoda’s style is that the body stone on the first floor is excessively narrower, longer, and higher than the stylobate. 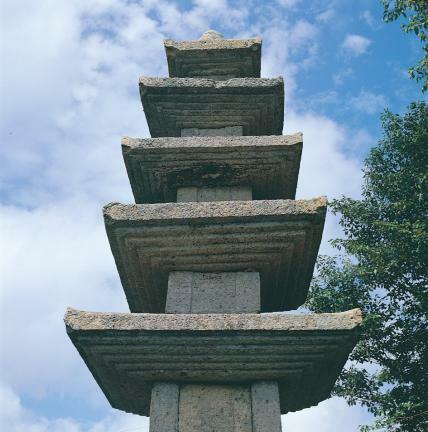 On the other hand, roof stones are much wider and thicker than the body stone, making the pagoda look unstable, and they look different from floor to floor. Moreover, the first, second, and fourth floors have five pedestals under the roof stone; the third floor has four pedestals, and the fifth floor, three pedestals. 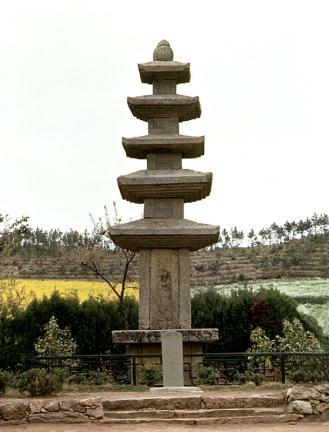 In other words, this pagoda follows no specific style. 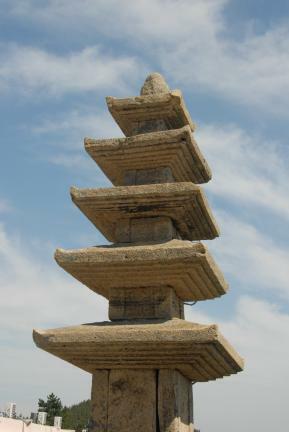 Meanwhile, the top of the pagoda has no decoration other than the bead-shaped one. 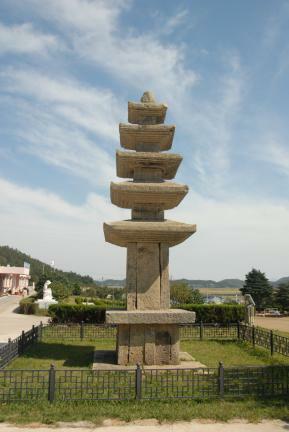 This pagoda’s very long stylobate and body stone are located on the first floor, as in the case of the Three-Story Stone Pagoda in Eunseon-ri, Jeongeup. 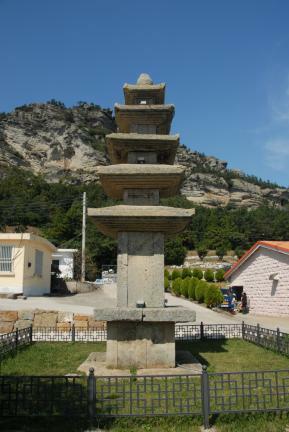 This is meaningful because it implies that Baekje’s style, which imitates the Five-Story Stone Pagoda of the Jeongnimsa Temple site in Buyeo (National Treasure No. 9), was also spread to the far south of the Korean Peninsula. 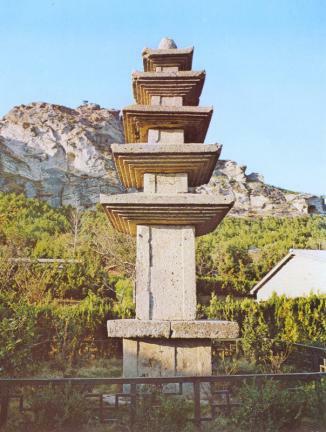 Considering the fact that each part often shows unique, irregular styles, the pagoda was probably built in the late Goryeo period during which regional characters often appeared in the styles of pagodas.